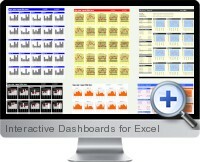 Interactive Dashboards for Excel is a set of 20 professionally designed one page printable Excel dashboard reports. The dashboards can be configured or customized for any type of data and business reporting requirements. Dashboard data can be entered, pasted or linked from external data sources and the interactive dashboards update automatically. The interaction is provided by allowing drilling down into levels of data for underlying time periods from a provided drop down menu. Dashboards print in high quality for publishing and reporting as hard copy or PDF. Interactive dashboard templates can be copied and customized to fit reporting needs. Generic dashboard setup is suitable for a wide range of business and financial analysis reporting requirements including executive reporting, sales and marketing analysis, financial reporting and business intelligence. Interactive drill down allows quickly viewing underlying data trends and gaining insights into business trends and dynamics. Dashboards update automatically to new data as a plug and play business reporting solution. The Excel interactive dashboards come with free lifetime product upgrades and access to tools and information on dashboard reporting best practices.